Here are some guidelines that will help you properly enter your rabbit in an ARBA sanctioned show. Most 4-H shows also work this way. Fair shows work similarly, but you may have to be a member of 4-H to enter some fairs. These guidelines apply to showing all breeds, that is, Mini Rex, Holland Lops, Mini Lops, Polish, Jersey Woolies, and all the rest! Determine which show you will attend. Visit the ARBA website for current shows in your area. You can also find show schedules in rabbit magazines (such as Domestic Rabbit which you receive with your ARBA membership), through your state club newsletter if there is one, and through your local 4-H leader. Request a show catalog or flyer. This will tell you where to send your entries if it is a pre-entry show, or what time the entries close if it is a day-of-show entry. The show flyer or catalog also lists details such as what breeds are sanctioned, what judges will be there, and the show’s location. You will want to contact the show secretary for a flyer. They may send you the catalog in the mail, but more and more, electronic means are being used. You may find show flyers on the ARBA website or on the website for your ARBA district. Some areas that use statewide or regional groups and websites to post catalogs as well. Once you have been showing for a year, you may find that you are on the mailing lists for the various clubs that sponsor shows and you will begin receiving show catalogs automatically. Select the rabbits you will show. It’s best not to send in your entries too soon, in case a rabbit decides to molt or develop an eye infection just before the show (but don’t miss the deadline, either). Some shows have day-of entry, so that you do not need to decide ahead of time which rabbits to enter. You will most likely have to pay for any animals you scratch that have been entered. Be sure to weigh your rabbits and check for disqualifications (like missing toenails) before you include the rabbit in your list. Of course, you can show a rabbit you know will be disqualified, just for the judge’s opinion. You can substitute rabbits at the last minute within the same class. That is, if your broken senior doe that was entered starts molting just as you pack your animals for a show, you may bring another broken senior doe. You may pay a fee such as $1 to make a change of ear number. Make sure you let the show secretary know when you check in at the show. And pay attention when the broken senior does are judged to make sure the change was made on the control sheet the judge’s writer uses to record placements. If you substitute a broken senior buck, though, you will most likely be asked to pay for the one you entered and to pay a late fee to enter the broken senior buck, in this example. And that fee is generally higher than the regular entry fee. Additionally, some shows allow no late entries whatsoever. Check the show catalog to be sure that your solid senior doe isn’t taking an unnecessary ride. Check for due dates on does. I typically only show does in the first 14 to 17 days of gestation. After that, they stay home. Contact the show secretary and let him or her know which rabbits you will be showing. I usually send in my entries by email, but generally you can call or write as well. Some shows only accept mail entries with payment. Others prefer email. Still others are day-of-show. This often varies by region, so be sure to get a hold of a show catalog. Some rabbitry software programs such as Evans will allow you to print out an entry form that you can take to the show. You can also download one from the Nature Trail! Click here for a Print -Out Rabbit Show Entry Form. 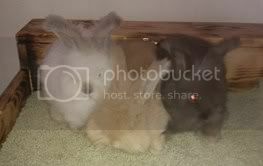 You will need to know the class of the rabbit you are showing (senior solid buck or broken junior doe, for example) and the ear number of the rabbit (which can actually be a combination of letters and numbers) and the breed (Holland Lop, Netherland Dwarf, Jersey Wooly, Mini Rex, etc). Be sure to indicate whether you will be showing in youth (ages 5 through 18) or open (all ages). Be sure you know whether there will be one, two or three shows for your breed on the day you will attend and register your animals accordingly (you may even have four shows in a quad weekend). You do not want to be surprised that your entry fees are double what you expected because your animals are each entered in two shows on the same day. Neither do you want to be excluded from show 2 (or show B) because you did not enter your rabbits correctly. If you haven’t tattooed the rabbit yet, don’t panic. Just select what the ear number will be: you will generally be able to have the rabbit tattooed when you arrive at the show. Ask the registrar if no one else is tattooing. The cost is generally $1 to $2 per rabbit. If you email your entries, you should receive a confirmation email in return. If not, make sure that you email them again and request a confirmation.